composing written work can often be an overwhelming endeavor. ​Opportunities to engage with others in the writing process can be supremely beneficial. WHAT IS A WRITING SALON? Writing Salons of 4-6 people are convened around each group's particular needs, interests, and goals. ​View topics and descriptions here. 2 hr. 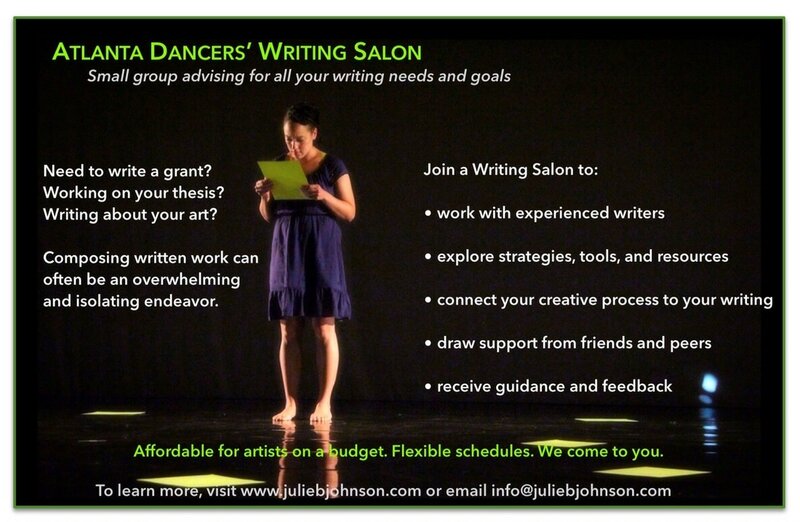 Writing Salon = $25 per person. If participants request we meet in a rental workspace, they incur the rental cost. "Julie is fantastic to work with and incredibly knowledgable. Our session answered each of my questions in an organized, informative, easy-to-digest way. Julie educates from her experience and success in the field. I have a much better sense of what to develop in my own work moving forward, thanks to Julie's custom tailored salon!" A 30 min. pre-session consultation to discuss your interest, needs, and goals. These conversations (via phone, email, or video chat) allow us to create a more meaningful and effective Writing Salon. A 2-hour Writing Salon that is geared specifically for your group of 4-6 participants. Lists of resources and strategies to take home with you. A 30-min. post-session consultation to follow up on any questions you may have. WHEN AND WHERE ARE THEY OFFERED? In the tradition of salon-style gatherings, we meet in living rooms, coffee shops, dance studios and public spaces conveniently located throughout Atlanta. Want to suggest a location? Where are you most comfortable and creative? Let us know! Contact us to arrange a time that works for you. Click here to meet our facilitators. ​Get a group of friends/peers together or arrange a Writing Salon just for you! Participants send us an email outlining their writing needs/goals/questions in advance of the salon so our facilitators can better meet your needs. Each participant will receive a list of resources, action items, and strategies to take home with them. apply your payment towards one of our Additional Services options. 48 hours advanced notice is required to receive a refund of your payment. Refunds are not granted without 48-hour notice. In the unlikely event that one of our Facilitators needs to cancel or postpone, you may choose another date or receive a full refund. No refunds are given once services have been rendered.